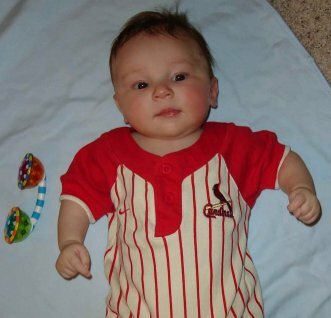 It's good to see another Cardinals' fan wearing his colors proudly. Oh wait, was this supposed to be a proud mom/cute baby moment? I get confused during the post-season when the Cardinals are playing. It's both, but the Cardinals supersede. Many more cute baby pics available at a later time. i think thats cute and by the way i am chris carpenter's biggest fan!! !